Dance Commentary by Heather Desaulniers: "Needles and Opium"
Creative genius. Passion. Loss. Dependence. Enmeshed physical and psychological journeys. This is Robert Lepage’s Needles and Opium, currently showing at ACT in San Francisco. The ninety-five minute theatrical exposition, which had its official opening night yesterday, is replete with compelling, mesmerizing and provoking scenework, all of which speak volumes to the human condition. While there may not have been much dance, at least not in a traditional sense, movement was a huge part of this work. Movement connected all the scenes – movement by the actors, movement of the lights, movement of images and movement by the set. And if you looked closely, you may have also noticed postmodern choreographic approaches peppered throughout Needles and Opium. In Lepage’s play, we encounter three primary characters, Robert and Jean Cocteau (both played by Olivier Normand) and Miles Davis (played by Wellesley Robertson III). All three represent different points in history, but Lepage has brilliantly weaved them together. Through Needles and Opium’s various scenes and vignettes, we see their stories intertwined through commonality – common personal experiences, a common city (Paris) and a common arts vocation (though each is engaged in different artistic disciplines). And then there is the common space they inhabit – Needles and Opium’s cube. Designed by Carl Fillion, it is within this cube that the three narratives transpire. A container suspended above the stage; one that is mobile, rotating and transforming the visual landscape. A structure that compartmentalizes and focuses the action of the play while simultaneously highlighting the shifting of time, reality and viewpoint. A member of the ensemble itself, the cube could even be regarded as a dancer within the cast, moving constantly through a series of choreographed phrases. Apparatus-based movement and choreography played a big role in Needles and Opium, appearing in a number of instances as well as bookending the work. Rigged by a harness, Normand or Robertson would float and swim in space or would walk down the sides of the cube, defying gravity and subverting expectations of perspective and possibility. It was impossible to look at this staging without being reminded of the postmodern icon Trisha Brown, who just passed away last month, and her equipment pieces from the late 1960s/early 1970s. Works where performers, assisted by harnesses and ropes, walked down the sides of buildings and along walls. But there was also stylized movement that was not apparatus-based, like when Robertson descended the walls of the cube towards a bathtub that was on the main stage surface. With anticipation, he turned smoothly and extended limbs into the space, choreographic material that was almost parkour in nature. Last, Needles and Opium featured a postmodern treatment of gesture, egalitarianism and non-conformity. During Normand’s soliloquy about opium and loss, a series of stylized gestures accompanied, emphasized and humanized the text. 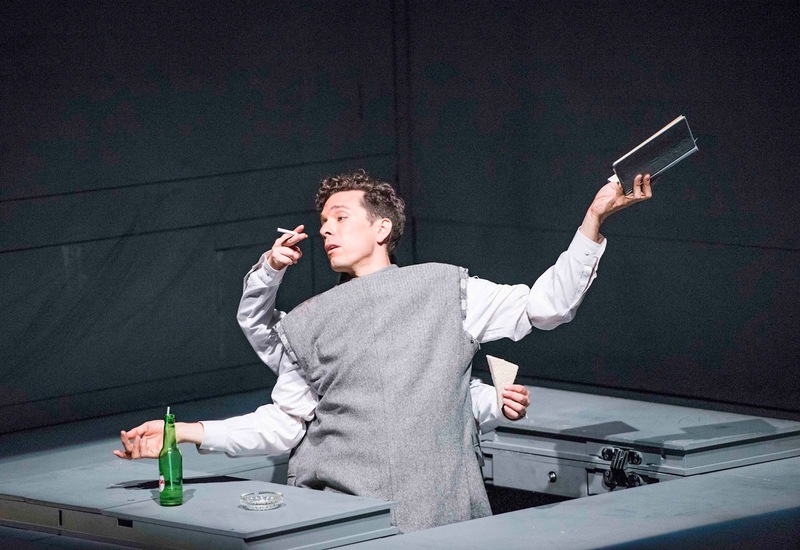 And in the sequence where Normand (as Cocteau) is posing for LIFE magazine, another collection of gestures and familiar everyday tasks unfolded, things that every member of the audience could understand and relate to. Yet, in true theatrical form (and with the postmodern sensibility in mind), they are taken one step further and are performed by four arms rather than two. San Francisco Ballet - "Swan Lake"